The Vizsla was already known in early Hungarian history. The ancestors of the present Vizsla were the trusted and favorite hunting dogs of the Magyar tribes who lived in the Carpathian Basin in the 10th century. Primitive stone etchings over a thousand years old show the Magyar hunter with his falcon and his Vizsla. Companion dogs of the early warlords and barons, Vizsla blood was preserved pure for centuries by the land-owning aristocracy who guarded them jealously and continued to develop the hunting ability of these "yellow-pointers". Records of letters and writings show the high esteem in which the Vizsla was held. The Vizsla survived the Turkish occupation (1526-1696), the Hungarian Revolution (1848-49), World War I, World War II and the Soviet Period. However, Vizslas faced and survived several near-extinctions in their history, including being overrun by English Pointers and German Shorthair Pointers in the 1800s (Boggs, 2000:19) and again to near-extinction after World War II. A careful search of Hungary and a poll of Hungarian sportsmen revealed only about a dozen Vizslas of the true type still alive in the country. From that minimum stock, the breed rose to prominence once again. 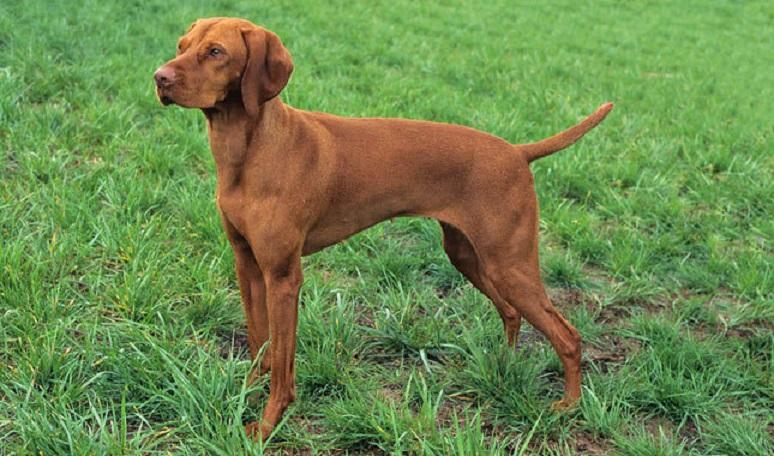 The various "strains" of the Vizsla have become somewhat distinctive as individuals bred stock that suited their hunting style. Outside Hungary, vizslas are commonly bred in Romania, Austria, Slovakia, and Serbia. The Vizsla started arriving in the United States at the close of World War II. As interest in and devotion to the breed began to increase, owners formed the Vizsla Club of America in order to gain AKC recognition. As a result of registering foundation stock with the AKC, Vizsla owners were able to obtain official recognition on November 25, 1960, as the Vizsla became the 115th breed recognized by the American Kennel Club.